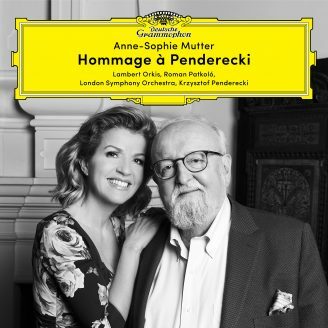 Throughout the year, the violin works by Krzysztof Penderecki formed a great thematic focus, commemorating the composer’s 85th birthday in 2018 and the many years of friendship between him and Anne-Sophie Mutter. In honour of the Polish composer, she played those works he has dedicated to her, the Violin Concerto No. 2 Metamorphoses (which she premiered in 1995) and the Sonata for Violin and Piano No. 2 (premiered by her in 2000), the Duo concertante per violino e contrabbasso (premiered by her in 2011) as well as La Follia for solo violin (which she premiered in 2013). A double CD with all the works Penderecki has been released on August 10th 2018, also including the first recording of the Sonata for Violin and Piano No. 2. Anne-Sophie Mutter began the new year of 2018 with Beethoven’s Violin Concerto: the tour with the Orchestre dell’Accademia Nazionale di Santa Cecilia under Sir Antonio Pappano’s baton took her to Italy and Germany. This outstanding work of violin literature was recorded by Anne-Sophie Mutter both with Herbert von Karajan and the Berlin Philharmonic and with Kurt Masur and the New York Philharmonic Orchestra. Recitals in the USA launched the Penderecki retrospective, while also taking Anne-Sophie Mutter and Lambert Orkis into the 30th year of their musical partnership. Bach’s famous Partita in D-minor and works by Brahms bookend the fascinating programme. At Carnegie Hall, Anne-Sophie Mutter also introduced her audience to musical terra incognita on March 4: The Fifth Season was composed by Sir André Previn and co-commissioned by the violinist and Carnegie Hall, commemorating the 125th anniversary of the legendary concert hall’s founding. Further recitals with Penderecki’s works followed in the composer’s homeland, also featuring the Scherzo from the romantic F-A-E Sonata by Brahms and Bach’s Partita in D-minor. Once again, Mutter’s partner at the piano was Lambert Orkis. Their joint recording of Beethoven’s sonatas for piano and violin won a Grammy Award, for example, and their recording of Mozart’s sonatas for piano and violin was awarded the prize of the French magazine Le Monde de la Musique. In Poland, Anne-Sophie Mutter also performed the Beethoven Violin Concerto – with the NOSPR Orchestra Katowice under the baton of Cristian Macelaru. In April 2018 she gave concerts with a member of her soloists’ ensemble, Mutter’s Virtuosi: together with cellist Pablo Ferrández, she played the Brahms Double Concerto in Oxford, with Marios Papadopoulos leading the Oxford Philharmonic Orchestra. This is another work Anne-Sophie Mutter has previously recorded: in 1993, together with António Meneses, the Berlin Philharmonic and Herbert von Karajan. The Violin Concerto No. 2 Metamorphoses, which Penderecki dedicated to her, was performed both with the London Philharmonic Orchestra under Lukasz Borowicz and with the Radio Symphony Orchestra Berlin. In the German capital, the composer conducted – as he did when this work was recorded with Anne-Sophie Mutter and the London Symphony Orchestra in 1997. Recitals in Luxembourg and Germany with Lambert Orkis followed in May and June. Their programme included Previn’s new work The Fifth Season, Penderecki’s Sonata for Violin and Piano No. 2, commissioned by her, as well as his Duo concertante per violino e contrabbasso, a work commissioned by the Anne-Sophie Mutter Foundation. The outstanding double bass player and former fellow of the Foundation Roman Patkoló inspired the writing of this work. The D-minor Partita by Bach and Mozart’s Violin Sonata K. 304 provide a contrast with the Penderecki focus. In Australia, Anne-Sophie Mutter appeared with the Sydney Symphony Orchestra under the baton of David Robertson, as well as the Melbourne Symphony Orchestra conducted by Sir Andrew Davis. She played John Williams’ Markings for solo violin, strings and harp, which the composer dedicated to her and which she premiered on July 16, 2017 together with the Boston Symphony Orchestra under Andris Nelsons in Tanglewood. This has been the Australian premiere of Markings. During these concerts in June 2018 she also performed Tchaikovsky’s Violin Concerto. This work has also been recorded twice so far by the artist: a 1988 recording with the Berlin Philharmonic under Herbert von Karajan was followed by another with the Vienna Philharmonic and Sir André Previn in 2004. This was followed by a benefit concert on September 20, given by Anne-Sophie Mutter with Daniel Barenboim at the piano in Berlin. Proceeds from the recital, performed in celebration of Konzertdirektion Adler’s 100th anniversary, have benefited the Barenboim Foundation and the Anne-Sophie Mutter Foundation in equal shares. The violinist’s next benefit concert on September 23 was in aid of the project “Liberation – Artist in Residence” at the Archabbey St. Ottilien. This concert drew attention to the little-known Jewish history of the Benedictine Abbey from 1945 to 1948: just one month after liberation from the Nazis’ machinery of death, a small orchestra led by the conductor Michael Hofmekler and the violinist Alexander Stupel gave the legendary “Liberation Concert” at St. Ottilien on May 27, 1945. In prison clothes, survivors of the former ghetto orchestra in Kaunas played for the patients of the hospital which had been erected on the grounds of the former Benedictine Abbey. In mid-October, Anne-Sophie Mutter continued her retrospective of Penderecki’s oeuvre as part of a tour through China: in Changsha, Guangzhou, Harbin, Kunming, Beijing, Shanghai, Xiamen and Zhengzhou, she performed the Violin Concerto No. 2 Metamorphoses as well as La Follia for solo violin. Her musical partners were the Sinfonia Varsovia and conductor Maciej Tworek. On November 6, Deutsche Grammophon celebrated its 120-year anniversary in Berlin: at the Philharmonie, Anne-Sophie Mutter joined the Staatskapelle Berlin under the baton of Manfred Honeck, performing John Williams’ Markings as well as Across the Stars (Love Theme) from Star Wars – Attack of the Clones, arranged by John Williams for Violin and Orchestra. 16 years after the film’s debut, this legendary piece came to life again in the world premiere in Berlin of a new arrangement for Violin and Orchestra. John Williams wrote this piece for, and devotes it to Anne-Sophie Mutter, with whom he has had a longstanding friendship. Anne-Sophie Mutter joined the National Orchestra of Spain under the baton of Christoph Eschenbach in Madrid on November 16 and 17, performing John Williams’ Markings and the Brahms Violin Concerto. This work was also recorded by the artist twice – both with Herbert von Karajan and Kurt Masur. On November 23, Krzysztof Penderecki celebrated his 85th birthday – at the gala concert Maciej Tworek conducted a performance of Penderecki‘s Violin Concerto No. 2 Metamorphoses with Anne-Sophie Mutter in Warsaw. After this birthday event she performed this work with the Royal Scottish National Orchestra in Scotland, conducted by the RSNO Music Director Thomas Søndergård. Deutsche Grammophon celebrated its 120-year anniversary in Asia as well: in Tokyo on December 5 and two days later in Seoul. In the Japanese capital, Anne-Sophie Mutter performed Camille Saint Säens‘ Introduction and Rondo Capriccioso with the Saito Tinen Orchestra; Seiji Ozawa conducted. In Seoul she played the Bruch Violin Concerto with the Seoul Philharmonic Orchestra under the direction of Lionel Bringuier. Two further benefit performances concluded Anne-Sophie Mutter’s 2018 concert calendar: on December 14, she joined former and current scholarship holders of her foundation in a concert in Wehr (Baden-Württemberg), performing in aid of the Hanna and Paul Gräb Foundation, and on December 15, she played in Aurach in Upper Austria, raising funds for the renovation of the church organ in the parish church of St. Rupert in Oberaurach. Anne-Sophie Mutter also takes a keen interest in alleviating medical and social problems of our times. She supports various causes through regular benefit concerts. Thus, in 2018 she will perform for the Barenboim Foundation, the Anne-Sophie Mutter Foundation, the Romanian orphanage in Victoria, the Hanna and Paul Gräb Foundation and for the renovation of the church organ in the parish church St. Rupert in Oberaurach (Austria). 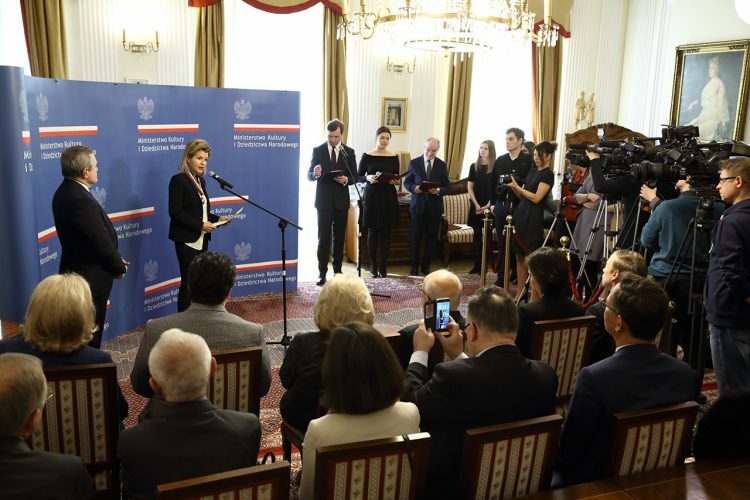 Poland awarded the Gloria Artis Gold Medal for Cultural Achievements to Anne-Sophie Mutter in March 2018, making her the first German artist to receive such an honour. In February 2018 she was named an Honorary Member of the Accademia Nazionale di Santa Cecilia. The year 2017 marks the 40-year anniversary of her debut as a soloist at the Salzburg Whitsun Concerts under Herbert von Karajan’s baton, which took place when she was 13, on May 28, 1977. Anne-Sophie Mutter started the year 2017 with a recital tour: concerts in Germany, England, France, the Netherlands, Austria and Switzerland took Anne-Sophie Mutter and Lambert Orkis into the 29th year of their musical partnership. In January and February they performed works by Sebastian Currier, Wolfgang Amadeus Mozart, Francis Poulenc, Maurice Ravel, Ottorino Respighi and Camille Saint-Saëns. The duo’s recording of Beethoven’s Sonatas for Piano and Violin won a Grammy Award, among others, and their recording of Mozart’s Sonatas for Piano and Violin was awarded the prize of the French magazine Le Monde de la Musique. Together with the Orchestre National de France conducted by Ken David Masur, Anne-Sophie Mutter appeared in concert in Paris in February, paying homage to the memory of Maestro Kurt Masur. The programme featured Henri Dutilleux’ Sur le même accord and Wolfgang Amadeus Mozart’s Violin Concerto No. 1 in B-flat major K. 207. The violinist recorded the contemporary work with the Orchestre Philharmonique de Radio France under Kurt Masur and the Mozart Violin Concerto in 1991 with the Academy of St. Martin in the Fields under Sir Neville Marriner, and again in 2005 with the London Philharmonic Orchestra, where the soloist also led the orchestra. In March 2017 Anne-Sophie Mutter appeared in concert with a member of her soloist ensemble “Mutter’s Virtuosi”: together with cellist Pablo Ferrández she performed the Brahms Double Concerto – Vladimir Jurowski conducted the London Philharmonic Orchestra. This work has also been recorded by Anne-Sophie Mutter: in 1993 with António Meneses, the Berlin Philharmonic and Herbert von Karajan. The violinist will perform Beethoven’s Violin Concerto in Leipzig with the Gewandhaus Orchestra under Herbert Blomstedt. This outstanding work of violin literature was recorded by Anne-Sophie Mutter both with Herbert von Karajan and the Berlin Philharmonic and with Kurt Masur and the New York Philharmonic Orchestra. In late March, Anne-Sophie Mutter and Lambert Orkis set out on a tour of the USA which takes them to Carnegie Hall, to San Francisco and Chicago, among other stops. At the Berlin Philharmonic, the Beethoven Violin Concerto was on the programme again in April – combined with Nostalghia by Toru Takemitsu. Her musical partners in the German capital were the Staatskapelle Berlin and Daniel Barenboim. Subsequently, Anne-Sophie Mutter performed the Tchaikovsky Violin Concerto and Nostalghia on four nights in Boston – together with the Boston Symphony Orchestra and conductor Andris Nelsons. In May, the violinist performed Tchaikovsky’s Violin Concerto in London, with Sir Mark Elder at the helm of the London Symphony Orchestra. This work has also been recorded twice so far by the artist: a 1988 recording with the Berlin Philharmonic under Herbert von Karajan was followed by another with the Vienna Philharmonic and Sir André Previn in 2004. Together with the Philharmonia Zurich under the baton of Fabio Luisi, Anne-Sophie Mutter played Max Bruch’s Violin Concerto No. 1 as well as Nostalghia: this tour took the artists through Germany, Switzerland, Austria and Luxembourg. The violinist recorded the Bruch Violin Concerto with the Berlin Philharmonic and Herbert von Karajan in 1982. May saw the first anniversary celebration in 2017 when Riccardo Muti conducted the Tchaikovsky Violin Concerto, paying homage to 40 years of the artistic partnership between Anne-Sophie Mutter and the Berlin Philharmonic. On June 4, the anniversary concert “40 Years: Anne-Sophie Mutter at the Salzburg Festival” followed. On this evening, the artist also enabled talented young colleagues to make their Salzburg debut. Together with the string ensemble “Mutter’s Virtuosi”, which unites scholarship recipients of the Anne-Sophie Mutter Foundation, she played Schubert’s Trout Quintet and Vivaldi’s Four Seasons – joined at the piano by pianist Daniil Trifonov. One day later, the audience in Baden-Baden had a chance to enjoy the performance of these exceptional musicians. La Scala in Milan was the next stop on the 2017 concert calendar: on three evenings, Anne-Sophie Mutter performed the Brahms Violin Concerto with the Filarmonica della Scala under the baton of Riccardo Chailly. This work was recorded by the artist both with Herbert von Karajan and again with Kurt Masur. On July 16, the violinist introduced her audience once again to musical terra incognita: together with the Boston Symphony Orchestra under Andris Nelsons, Anne-Sophie Mutter gave the world premiere of John Williams’ Markings – a work for solo violin, strings and harp which the composer dedicated to the soloist. On the same evening in Tanglewood, she also performed the Tchaikovsky Violin Concerto. Anne-Sophie Mutter returns from her summer break with another recital tour, performing with Lambert Orkis at the festivals in Schleswig-Holstein, Gstaad and Salzburg. At the Salzburg Summer Festival, she also performs with Manfred Honeck, who conducts the Pittsburgh Symphony Orchestra. On August 29, the programme features music by Witold Lutoslawski: his Partita for Violin and Orchestra and Chain 2 – Dialogue for Violin and Orchestra. The Partita was dedicated to her by the composer, and the violinist made the first recordings of both works in 1988, in which Witold Lutoslawski conducted the BBC Symphony Orchestra himself. In September, Anne-Sophie Mutter gives further performances with Manfred Honeck and the Pittsburgh Symphony Orchestra in Germany, England, Romania and Switzerland. She performs the Violin Concerto by Antonin Dvořák – which she recorded for CD with the Berlin Philharmonic under Manfred Honeck in 2013. During subsequent performances in the USA, Anne-Sophie Mutter appears with the Buffalo Philharmonic Orchestra under the baton of Joann Falletta. In Buffalo she opens the new concert season with the Tchaikovsky Violin Concerto, in Chicago with Mozart’s Violin Concerto No. 5. Here, two further evenings with Tchaikovsky follow. On October 8, the violinist appears in Monte Carlo: together with the Orchestre Philharmonie de Monte Carlo under Lawrence Foster, she performs Henri Dutilleux’ Sur le même accord and Wolfgang Amadeus Mozart’s Violin Concerto No. 2 K. 207. Both works are also available on CD: she recorded Sur le même accord with the Orchestre Philharmonique de Radio France and Kurt Masur in 2005. There are two recordings of Mozart’s Violin Concerto No. 2: one with the Philharmonia Orchestra London and Riccardo Muti (1982) and one with the London Philharmonic Orchestra (2006) led by Anne-Sophie Mutter herself. On November 11, she performs once again with former and current fellows of the Anne-Sophie Mutter Foundation: at the Konzerthaus Berlin, André Previn’s Piano Trio, Ludwig van Beethoven’s String Trio in C-Minor Op. 9 No. 3 and Dmitri Shostakovich’s Piano Trio No. 2 in E-Minor Op. 67 will be played. She is joined by Vladimir Babeshko (viola), Daniel Müller-Schott (cello) and Lambert Orkis (piano). In 1989 Anne-Sophie Mutter recorded Beethoven’s early string trios with Mstislav Rostropovich and Bruno Giuranna – she revisits one of them in this Berlin programme. With her recital tour in November 2017, which takes her to four German cities and to Barcelona, Anne-Sophie Mutter commences her programmatic focus of 2018. Honouring the Polish composer Krzysztof Penderecki, who celebrates his 85th birthday this coming year and who has been her friend for many years, she has programmed two of his works for this tour: the Sonata for Violin and Piano No. 2, which she commissioned and premiered in 2000, and the Duo concertante per violino e contrabbasso, commissioned by the Anne-Sophie Mutter Foundation. For this work, the outstanding double bass player and former fellow of the Foundation, Roman Patkoló, originally gave the first impulse. The famous Partita in D-Minor by Bach, the Scherzo from Brahms’ romantic F-A-E Sonata and a selection of his Hungarian Dances frame the intriguing programme. The piano part is played by Lambert Orkis, with whom Anne-Sophie Mutter will celebrate 30 years of continuous collaboration in 2018. In November 2017, Anne-Sophie Mutter and Daniil Trifonov released their first joint album, focusing on one of the most famous work in all the classical repertoire. Together with Hwayoon Lee, Maximilian Hornung and Roman Patkoló, they recorded Schubert’s Piano Quintet in A-major, generally known as the “Trout Quintet”. The programme also includes Schubert’s Notturno, a masterful late work for violin, cello and piano, as well as his songs Ständchen and Ave Maria, arranged for violin and piano. In 2017 she performed a benefit for integration projects in Leipzig („Integration durch Bildung e.V.“ and „Interaction Leipzig e.V.“) and another one for the cancer research at the Fred & Pamela Buffett Cancer Center in Omaha. 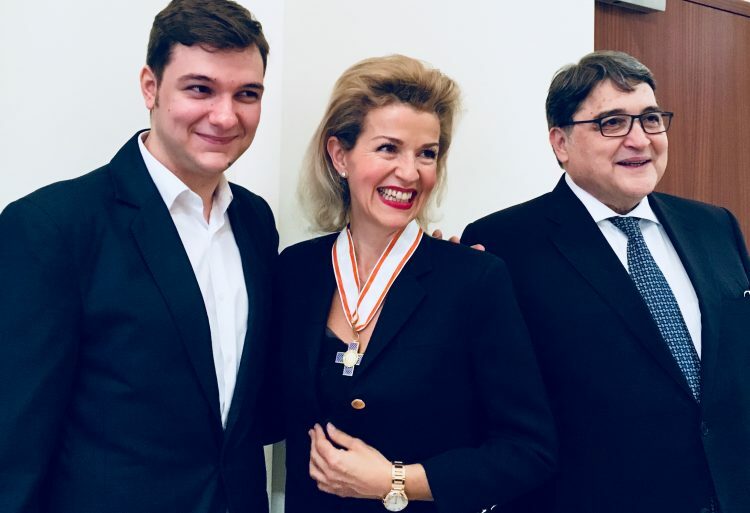 Romania awarded the Order of Cultural Merit in the rank of a Grand Officer to Anne-Sophie Mutter in November 2017; during the same month France honoured her by presenting her with the insignia of a Commander of the French Order of the Arts and Literature. The Romanian Order of Cultural Merit in the rank of a Grand Officer was presented to Anne-Sophie Mutter by the Romanian Ambassador, H. E. Emil Hurezeanu (right), on November 10, 2017. On the left is the cellist Andrei Ionita, who performed during the ceremony. 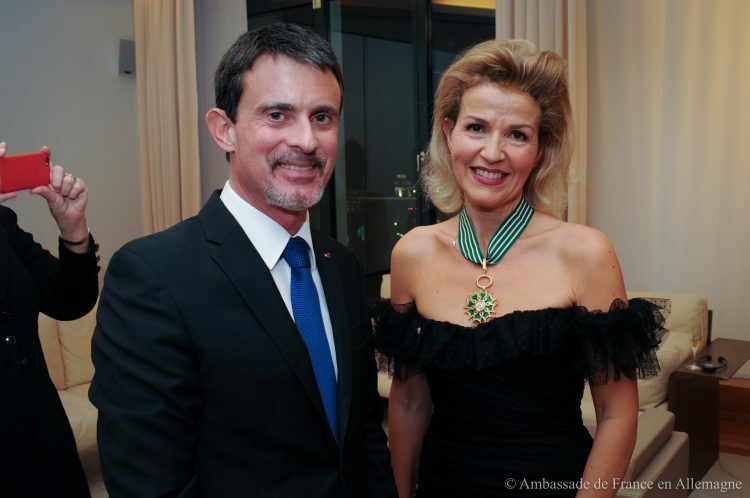 Manuel Valls, the former Prime Minister of France, presented the insignia of a Commander of the French Order of Arts and Literature to Anne-Sophie Mutter on November 10, 2017 at the French Embassy in Berlin. The year 2016 marks the 40-year anniversary of her debut at the age of 13 at the Lucerne Festival on August 23, 1976. One year later, she performed at the Salzburg Whitsun Concerts under Herbert von Karajan’s baton. She performs the Brahms Violin Concerto, which the artist has recorded both with Herbert von Karajan and with Kurt Masur, in London in March 2016, with Thomas Adès conducting the London Symphony Orchestra. The Salzburg Easter Festival’s concert programme includes the Beethoven Triple Concerto, in which Mutter is partnered by Yefim Bronfman, Lynn Harrell and the Sächsische Staatskapelle Dresden under the baton of Christian Thielemann. In this exclusive constellation, Beethoven’s Concerto Op. 56 for Piano, Violin, Cello and Orchestra is also performed in Dresden in April. In April 2016 Anne-Sophie Mutter is on tour for the fifth time with her Foundation’s exclusive soloist ensemble: Mutter’s Virtuosi perform on ten evenings in Aix-en-Provence, Barcelona and eight German cities. Sir André Previn’s Nonet for Two String Quartets and Double Bass opens the concerts, followed by Johann Sebastian Bach’s Double Concerto for Two Violins as well as Antonio Vivaldi’s “Four Seasons”. The Previn Nonet – commissioned by the violinist for Mutter’s Virtuosi and dedicated to her – had its world premiere in Edinburgh on August 26, 2015; it was first performed at all the concert halls of this tour. At the memorial concert for Kurt Masur at Leipzig’s Gewandhaus on April 16, Mutter performs the Mendelssohn Violin Concerto with the Gewandhaus Orchestra under Michael Sanderling. She also recorded this classic of the violin repertoire in 2009 – with the Gewandhaus Orchestra and Kurt Masur. Anne-Sophie Mutter performs the Violin Concerto by Antonín Dvořák – released on CD with the Berlin Philharmonic and Manfred Honeck in 2013 – again with Manfred Honeck in 2016: in Prague he conducts the Czech Philharmonic and in Munich in June the Pittsburgh Symphony Orchestra. Three exceptional soloists tour Europe together for the first time in May, when the “Mutter-Bronfman-Harrell Trio” appears in Germany, Italy, Russia and Spain. The exceptional ensemble performs Ludwig van Beethoven’s “Archduke Trio” and Piotr Ilyich Tchaikovsky’s Piano Trio in A-Minor Op. 50. The subsequent recitals in Germany, France, Luxemburg, Austria and Switzerland take Anne-Sophie Mutter and Lambert Orkis into the 28th year of their musical partnership. During these concerts in June 2016, they perform works by Sebastian Currier, Wolfgang Amadeus Mozart, Francis Poulenc, Maurice Ravel and Camille Saint-Saëns. Their recording of Beethoven’s Sonatas for Piano and Violin won a Grammy Award and their recording of Mozart’s Sonatas for Piano and Violin with the prize of the French magazine “Le Monde de la Musique”. At the Lucerne Summer Festival, Anne-Sophie Mutter appears in September with the Orchestra of the Lucerne Festival Academy under Alan Gilbert. The programme includes the Violin Concerto “To the Memory of an Angel” by Alban Berg as well as Norbert Moret’s “En Rêve”. 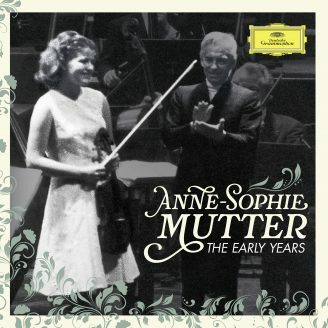 Mutter’s recording of Berg’s Violin Concerto with the Chicago Symphony Orchestra and James Levine won a Grammy in 1994; she recorded the work “En Rêve”, which Moret dedicated to her, with the Boston Symphony Orchestra under Seiji Ozawa in 1991. In celebration of the 35-year anniversary of Anne-Sophie Mutter’s debut in Japan, she performs in Tokyo in October with the Vienna Philharmonic under Seiji Ozawa and with the New Japan Philharmonic under Christian Macelaru. In addition, the Japanese metropolis sees a guest performance by “Mutter’s Virtuosi” and appearances with Japanese music students. In addition, she embarks upon another Asian tour with Lambert Orkis: in October, these two perfectly attuned musicians perform in China, Japan, Korea and Taiwan. In November follows a concert tour with the London Philharmonic Orchestra under Robin Ticciati: in London, she performs the Beethoven Violin Concerto; in Paris, Vienna and in seven German cities, the Mendelssohn Violin Concerto will be heard. Anne-Sophie Mutter appears in Suzhou, a city of 10 million inhabitants on the lower reaches of the Yangtse River, on December 31, 2016, during the founding concert of the Suzhou Symphony Orchestra, which first presents itself to the public on this evening. Both Chinese and classical European compositions will be performed – for example, the last movement of Beethoven’s Symphony No. 9 forms the festive finale. Xie Yang Chen conducts; Anne-Sophie Mutter plays Pablo Sarasate’s "Carmen Fantasy" and Camille Saint-Saëns’ "Introduction et Rondo capriccioso". 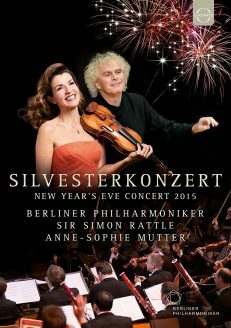 The live recording of the New Year’s Concert together with the Berlin Philharmonic under the baton of Sir Simon Rattle is released end of January on DVD and Blu-ray disc. 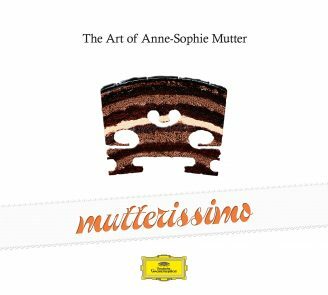 To celebrate the charismatic artist's 40-year stage anniversary, Deutsche Grammophon is releasing the double CD Mutterissimo - The Art of Anne-Sophie Mutter in December 2016. In December 2016 the Spanish Ministry of Education, Culture and Sports awards her the “Medalla de oro al Mérito en las Bellas Artes” (Gold Medal of Honour in Fine Arts). The 2014/2015 season, featuring concerts in Asia, Europe and North America, reflects the violinist’s musical versatility and her unequalled rank in the world of classical music: as “Carnegie Hall’s 2014/2015 Perspectives Artist” Anne-Sophie Mutter presents her interpretations of traditional and contemporary compositions at the legendary Isaac Stern Auditorium. She also undertakes the third tour with “The Mutter Virtuosi”, the ensemble of the Anne-Sophie Mutter Foundation, this time through North America. She gives guest performances with the Symphony Orchestras of Pittsburgh and San Francisco and with the Berlin and Vienna Philharmonics, the London Symphony Orchestra and Oxford Philomusica. These are complemented by tours with the Royal Concertgebouw Orchestra, the Danish National Symphony, the National Orchestra of Spain, the New World Symphony and the Cherubini Youth Orchestra. Together with Yefim Bronfman and Lynn Harrell, she forms a high-carat touring chamber music trio. In Berlin, she performs classical music in nightclubs, tearing down cultural barriers. A recital tour with Lambert Orkis concludes Anne-Sophie Mutter’s 2014/2015 concert season. She opens the Pittsburgh concert season together with the Pittsburgh Symphony Orchestra under Manfred Honeck, and in New York she performs at the Opening Night gala of the Carnegie Hall season together with Sir Simon Rattle and the Berlin Philharmonic. This evening also launches Mutter’s “Carnegie Hall 2014/2015 Perspectives” concert series: between October 2014 and April 2015, she performs works by Bach, Beethoven, Berg, Bruch, Currier, Franck, Moret, Previn, Sibelius, Tchaikovsky and Vivaldi on six different concert occasions. On one of these, she first appears at Carnegie Hall with her soloist ensemble “The Mutter Virtuosi”: the programme at the legendary Isaac Stern Auditorium includes the US premiere of Previn’s Violin Concerto No. 2, Bach’s Double Concerto for Two Violins as well as Vivaldi’s Four Seasons. The ensemble “The Mutter Virtuosi” includes 14 current and former scholarship students of the Anne-Sophie Mutter Foundation and appears in six further North American cities in addition to the Carnegie Hall appearance. At these concerts, Anne-Sophie Mutter will also perform Sebastian Currier’s Ringtone Variations for Violin and Double Bass together with Roman Patkoló, commissioned by her foundation. As part of a European tour, Anne-Sophie Mutter performs the Sibelius Violin Concerto in January 2015 with the Danish National Symphony Orchestra under the baton of Cristian Macelaru. Another concert tour featuring this work follows in March, then with the Royal Concertgebouw Orchestra under Andris Nelsons. Anne-Sophie Mutter has recorded this 20th century classic with the Staatskapelle Dresden under Sir André Previn. The Brahms Violin Concerto – which the artist has recorded both with Herbert von Karajan and with Kurt Masur – leads her to San Francisco in February; Michael Tilson Thomas conducts the San Francisco Symphony. In March, the violinist visits the United Arab Emirates and the Sultanate of Oman: under the baton of Riccardo Muti, who conducts the Luigi Cherubini Youth Orchestra, Anne-Sophie Mutter performs Beethoven’s Violin Concerto. This outstanding gem of violin literature was also recorded by her both with Herbert von Karajan and with Kurt Masur. In April the “Mutter-Bronfman-Harrell Trio” tours through Canada and the USA. The programme performed by this exclusive ensemble includes Ludwig van Beethoven’s Archduke Trio and Piotr Ilyich Tchaikovsky’s Piano Trio in A-Minor Op. 50. Norbert Moret’s concerto for violin and chamber orchestra, En Rêve, which the composer dedicated to Anne-Sophie Mutter, is performed for the first time in the United States on April 25, 2015 in Miami. Her partners for this US premiere are the New World Symphony under the baton of Michael Tilson Thomas. Anne-Sophie Mutter also performs Alban Berg’s Violin Concerto To the Memory of an Angel in Miami. Both violin concerti have been recorded by Anne-Sophie Mutter: En Rêve with Seiji Ozawa and the Boston Symphony Orchestra and the Berg Violin Concerto with James Levine and the Chicago Symphony Orchestra. In May, she performs classical music in a club: on stage at the Yellow Lounge at Berlin’s venue Neue Heimat, Anne-Sophie Mutter is joined by her longtime accompanist Lambert Orkis, the Mutter Virtuosi and harpsichordist Mahan Esfahani. The programme spannes three centuries of classical music – from Johann Sebastian Bach and Antonio Vivaldi to George Gershwin and John Williams – and has been conceived by Anne-Sophie Mutter exclusively for the Yellow Lounge. The Violin Concerto Anne-Sophie brings the composer, conductor, classical and jazz pianist André Previn back to an institution of which he was chief conductor for more than a decade: in June 2015 he celebrates his 85th birthday by conducting the London Symphony Orchestra once again when Anne-Sophie Mutter performs the violin concerto dedicated to her. Previn led the world premiere with the violinist and the Boston Symphony Orchestra in March 2002; in this constellation, the work is also available on recording. The following recitals in Germany, Austria, Spain and Switzerland take Anne-Sophie Mutter and Lambert Orkis into the 27th year of their musical partnership. At these concerts in June and July 2015, they perform works by Béla Bartók, Ludwig van Beethoven, Ottorini Respighi and Maurice Ravel. 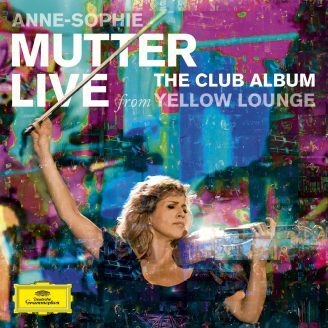 The live recording of her club performance in May 2015, Anne-Sophie Mutter – Live from the Yellow Lounge, is released August 28th on CD and Blu-ray disc. This is the first live recording of a Yellow Lounge ever. In January, 2015, Anne-Sophie Mutter is named an Honorary Fellow at Oxford University’s Keble College.